I checked in with Emily Hindrichs, who will sing the role of Tytania in A Midsummer Night's Dream on Friday and Sunday nights. JD: Emily Hindrichs, we're delighted to have you back at Seattle Opera's Young Artists Program for another colorful character, after you wowed us last year as that punk pyro Fire-boy in L'enfant et les sortilèges (left, menacing Elizabeth Pojanowski's Enfant) among other roles. Tell us what you've been doing since then. EH: I spent a summer at the Tanglewood Music Festival in Lenox, Massachusetts, bought my first house, and promptly left it to work at English National Opera this spring, where I got to wear another amazing wig, though it was more traditional than Fire's red mohawk. JD: Shakespeare's words and Britten's music have a reputation of being pretty hard-core. Do you find performing Tytania in Midsummer more challenging than other opera roles? If so, does that make it more fun, or is it hard work? EH: Tytania has long been a dream role of mine. Britten and Pears adapted Shakespeare for the opera and, in a sense, they did most of the work for us already. The text setting is very precise, so the singer's hardest task it to figure out how to make that character relevant through their language. JD: Tell us a little about your character. What motivates a Fairy Queen? EH: Tytania and Oberon's conflict is all about power - he has it, she takes it, he wants it back. 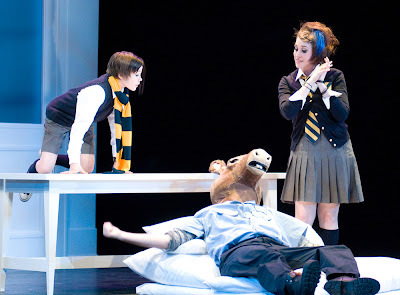 Peter Kazaras puts these two characters on more equal footing by allowing Tytania to recognize Oberon's deception in the third act before they reconcile. I think this makes their relationship more interesting because it keeps that thread of tension going - you know this isn't the last time they'll fight or make up. JD: What's your favorite part of the show? EH: The first conflict at the top of the show - call me biased, but I like the music for the fairies the most. JD: What's next for you? Do you have a website where your fans can track your activities? May - all of that information is on my website, www.emilyhindrichs.com.